Lo Shu Magic Square / Grid is an incredible as well as exact Fengshui approach which can help you examine life and the future based on Chinese methodology. Your Feng Shui Lo Shu square offers a look into your future. Furthermore, it displays your lacking elements in your current existence. 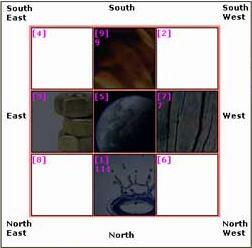 The actual Feng Shui Lo Shu Calculator is a three by three matrix or square. Each square in the grid is represented by a number. The significance of magic squares is that the total sum of numbers by columns, rows or diagonals comes to fifteen. It is deemed by Chinese to exhibit a person's connection with all the 5 elements which is fire, metal, earth, metal, water and wood. What are the five Chinese elements? What are Lo Shu numbers associated with these elements? Fire is relates to number 9. Water with number 1. Metal with numbers 6 and 7. Element earth with numbers 2, 5 and 8. Wood with numbers 3 and 4. This is but rudimentary introduction to Chinese Lo Shu numerology. You'll find various helpful remedies for your absent elements. Consider your natal details for this purpose. Restorative methods can make one's life much easier. Using different items that are considered as solutions for missing elements can create harmony and peace in your life. You'll find different ways to overcome problems by finding the missing elements in your life with the help of this free online Fengshui app. Get a full Lo Shu Analysis for 2016, 2017 now! very good, but seems to be uncompleted remedial measures. As is feasible to me, i am sleping in North-West corner rom of my house, but in that room i am sleping in south-west corner with head towards south i am sleping is it ok. Further i got a heath issue since long, but not making me to sufer, but wanhts to get rid of problem in view of ensuing old age & reducing strength. can you detail with remedies pl. Thank you for creating this possibility :) Very useful!